The AGA has become one of the most iconic traditional cookers, first appearing in kitchens from the 1920’s and is now populating more than 750,000 homes across the world. With the cooker being a classic kitchen statement, having the right splashback to complement both your AGA and interior is an important task. There’s a long tradition of using hand-painted tiles in the splashback. behind an Aga cooker. Handmade tiles offer durability combined with a uniquely created design. These days, however, you can achieve the hand-painted look with custom printed tiles for your Aga cooker’s splashback. UniqueTiles will create custom tiles with your chosen design, color preferences and style to use on the backsplash behind your Aga cooker. With bespoke tiles, you can create the kitchen of your dreams that is uniquely created for you and your home. What is the overall style of your kitchen? Is your kitchen modern, traditional, rustic or contemporary? This is the first consideration; you’ll want your design, pattern and colour choices to reflect your entire kitchen’s style. For example, if you have a rustic kitchen, you might consider a country mural behind your Aga cooker. Maybe you have a more contemporary kitchen; in this case, you could consider a more modern design of marble tiles, in a colour that fits in with your countertops, cabinets and flooring. Consider the overall style of your kitchen to ensure that your Aga cooker’s splashback fits in, to create the unique, charming kitchen of your dreams. Will, you only be designing the space over your cooker, or will you be designing the entire backsplash area of your kitchen? Will you want the design and colours behind your Aga to be the focus? You’ll want to ensure the design and colours on the digitally printed tiles blend in with your current splashback and countertops. Also, do the patterns and colours of the unique tiles blend in with your floor and cabinets? You’ll want to make sure that your entire kitchen forms a beautiful combination between your Aga cooker and it’s splashback with the rest of your kitchen. UniqueTiles can help you create a beautiful splashback design for your Aga cooker, with custom printed tiles that have a hand-painted look. Your imagination is the only limit to what you can create with our bespoke tiles. Does your Aga cooker sit in a small niche or alcove in your kitchen? If your kitchen has a country or rustic design, you could use patterned bespoke tiles for your cooker’s splashback. Depending on the overall colours used in your kitchen, you could choose an old-world motif such as a traditional blue and white design resembling hand-painted delft tiles. Is your kitchen more contemporary, then another option would be patterned tiles with a Moorish or Mediterranean design, in one or more colours to complement your overall kitchen. The splashback area behind your Aga cooker could also be used for a beautiful mural. Murals make a beautiful statement in any style of kitchen. 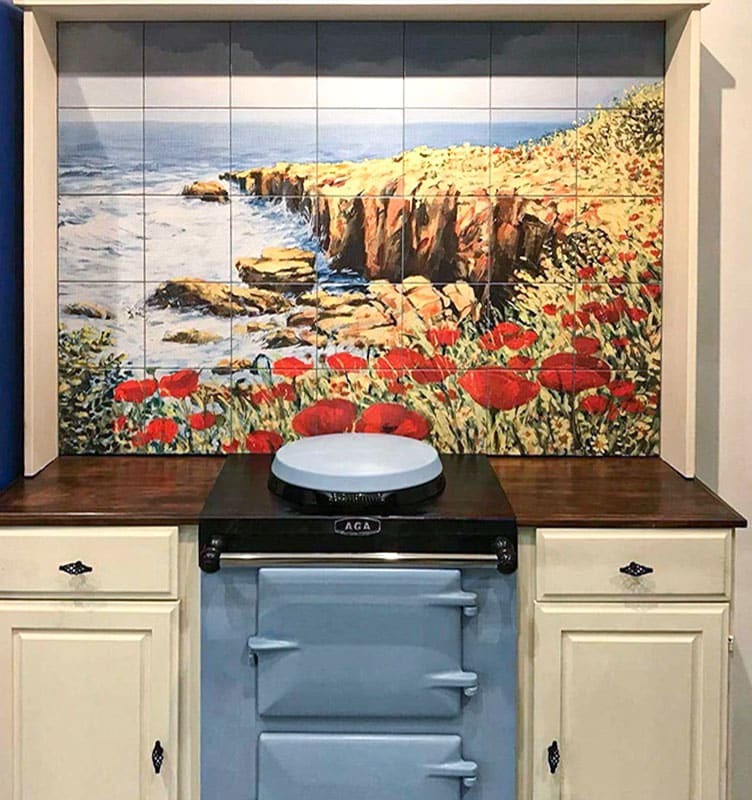 Here, UniqueTiles can recreate one of your favourite photos, images, or designs—there’s no limit to the murals we can create for your Aga’s splashback space. The type of mural you choose will depend on the overall style of your kitchen. Do you have a modern kitchen? Then perhaps you could create a mural of typographic custom printed tiles. Typographic custom printed tiles use words and other elements you choose to use on each tile. For instance, you could use the ingredients from a favourite recipe to create bespoke tiles for your Aga cooker’s splashback. Or you could use the words from a beautiful poem or a love letter, combined with flowers, butterflies and more to create a beautiful, unique splashback. 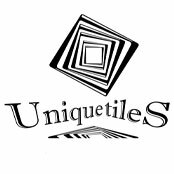 Your satisfaction is our priority at UniqueTiles. Our team of talented, professional designers work will work with your unique vision to create the kitchen of your dreams. With unique, digitally printed tiles, we’ll work directly with you to create a stunning backsplash for your Aga cooker. We stand behind our work with a 25 years warranty on the tiles, and you can even request a sample tile to see how the colours and patterns will look in your kitchen. With UniqueTiles, you can rest assured that your Aga cooker’s splashback will become a work of art—designed by you with our unique kitchen tiles.